Watched a movie last night, "Still Alice." Beforehand, much debate by the fireside. Watching a film about Alzheimer's - would it only be depressing and scary, are we too chickenshit to face some difficult truths about it, etc. Anyway, eventually watched it. It's beautifully controlled acting and direction, and it was clever of them (and the original novelist) to choose early-onset Alzheimer's in a high-drive successful professional whose field is - words. 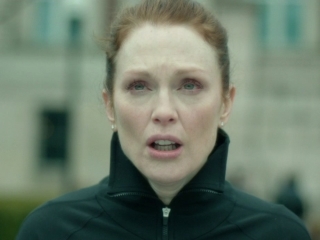 The above still is from the secene when, out jogging in once-familiar surroundings, Alice (Julianne Moore) can't recognise where she is. The still below is much later on in the progression of the disease, with her daughter, who turns out to be strong-minded and self-denying. I don't really want to get far into the film itself. They are a family of prosperous middle-class Americans, so that cushions the blow somewhat, but it is still thought-provoking, moving, scary. I'm more interested in trying to contemplate the dissolution of a unique consciousness. This next bit may seem a little stern, not too many laughs, so please leave now if you're feeling fragile! Thing is, every consciousness comes to an end. We can ignore that knowledge, or live with it. Without dementia, consciousness comes to an end either abruptly, or gradually through illness etc, but either way, it lasts more or less to the end of life itself. Up to that point, our memories work away all the time, providing the basis for our sense of "me." That "me" isn't static, it is continuously reconstructed by our brain's activity; but with dementia, the lightning-fast continuous reconstruction job runs out of building blocks. There's an agonising scene in which after watching her daughter's performance in Chehov's "The Three Sisters," Alice goes up to her and asks her if she is staying on in town for the rest of the summer season. Someone has to tell Alice that she is talking to her daughter. Familiar enough situation to care workers and the family of dementia sufferers, no doubt. Before she reaches that stage, Alice tells someone that she'll fight it as long as she can, and as her memory goes she will just have to live in the present. Living in the present is all any of us can do, of course - the rest is memory, anticipation or fantasy. But eventually, inevitably, Alice can't carry on living in the present as "Alice," because she loses her sense of identity, of self. She just lives. Entirely in the present, but hardly aware any longer of herself as "Alice." I think many of us are more scared of losing our "me" consciousness, our sense of self, than we are of death itself. So, what is to be held up against this fear and pain? Our culture is trying to get to grips with the size and scope of the problem - so many old people surviving illness until dementia strikes. But NB: it doesn't always strike. I know from my work as a funeral celebrant that very many people live on into their 80s and 90s with no dementia, just memory loss, the sort that makes me forget where my glasses are. That's not dementia. Dementia is when I don't know what my glasses are for. And there are things we can do to keep our minds going. As you might guess if you've ready any of this blog before, I'm placing a bet on meditation. And the love of family and friends. And the Guardian quick crossword. It's not a depressing movie, ultimately. It is just a challenge being grown-up about this stuff. OK, you can come back into the room, I'm done with the scary stuff, more conversations with rivers soon. You might want to read my next post, "walking, age, Ken Jones" to let some realism and humour into feelings about getting old. Not that poor Alice was old, of course.